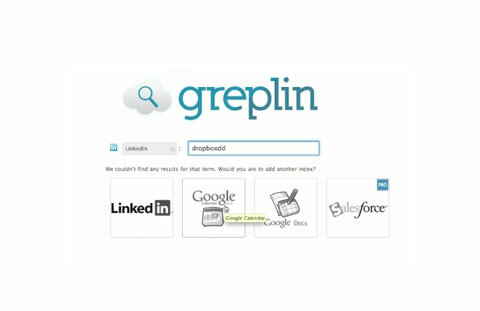 Greplin is a new fantastic personal search engine that has emerged through Y combinator. We all have tons of personal data stored online in the shape of emails, social media based private and public messages, tweets, voicemail transactions, SMS and much more. All this data exists in the cloud and Greplin now lets you search this personal data with a simple procedure. You just need to sign up and authorise any number of social services for Greplin to index. When you sign in with any (or more than one) of your services like Facebook, Twitter etc, Greplin starts indexing them and then presents you with a Google-like search engine. You can type in a query and find all your public and private personal data you have on those sites. Tweets, including DMs, are shown, as well as Facebook messages and Google Voice voicemail transcriptions and SMS. It also shows real time results as you type. You can also index Gmail, Dropbox, LinkedIn and a bunch of other services. Greplin only uses OAuth and other APIs for authorization, so they never see your third party site credentials. The site will be free for most of its services but will charge a fee for more features like searching inside of attachments. Greplin is already getting a lot of attention from investors and potential buyers as it’s a great new idea and a service that should have been invented long ago. This is the other side of the web search picture and one that is definitely here to stay. Public and personal search are going to be the 2 forms of web search in the future and Greplin is the one kick starting the process. Internet In 2020, All in the Cloud?